Cart2Cart continues to please its users and adds a new solution to the list of supported carts. Now we give you an opportunity to switch from Actinic to 55 popular shopping carts, such as Magento, PrestaShop, WooCommerce and OpenCart, etc. Enjoy an easy and effortless transfer of e-store data including all products, customers and orders with the most convenient method of migration. Just multiply your chances for success and expand your business using the possibilities presented by Cart2Cart! Beautiful design options.. There is the opportunity to create an eye-catching look of a web shop even using the basic templates. Moreover, the store designer tools are easy- to-use, and you do not need technical or coding skills to get the hang of them. Simple e-store management. You can control your inventory, clients and orders through a single console. Also, it allows the customers to track their orders online. Powerful SEO tools. This feature is really significant for any store as it allows your shop to be more visible in search engines and to increase your rankings. Furthermore, keywords that make the traffic of your e-store can be analysed. Mobile-friendly engine. The e-store can be automatically optimized for mobile devices using responsive design. 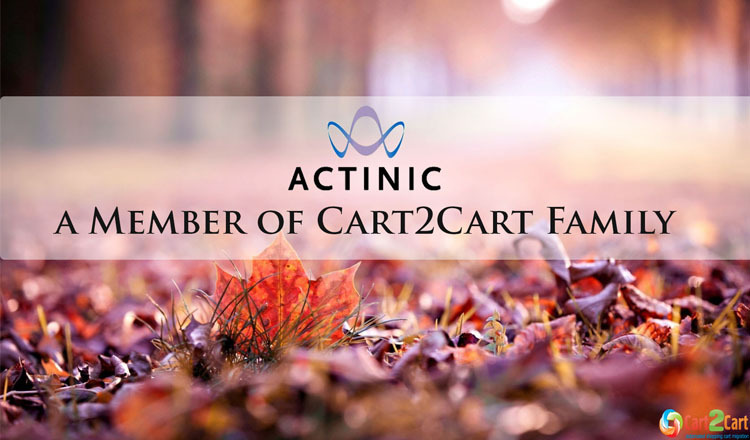 If your business expands and there is a need of more powerful solution, benefit from the migration from Actinic to more than 55 shopping carts. However, in case when there are still some doubts, check the functionality of service with free Demo Migration. The procedure takes less than 30 minutes and helps to transfer up to 10 entities. So, move forward to join the ranks of the e-Commerce leaders, choose a new platform and sign up right away!